Free Cloud Computing Platform as a Service (PaaS) from AppFog has more flexibility than any Platform as a Service right now to the developers.Here is overview. To gain some theoretical knowledge on Platform as a Service (PaaS), you can start from here. Another Free Cloud Computing Platform as a Service (PaaS) we wrote about before is Heroku. As soon we ‘discovered’ that Facebook Apps are nothing but a kind of iframing, the last love for Heroku lost. Heroku’s mixture of a odd own platform on Amazon’s infrastructure kills the love for any experienced Platform as a Service (PaaS) user. Sometimes the Git Bash throws updating app or some message forever and it makes me reminding our old grid computing style. Another factor or bias I can not ignore, I actually hate Amazon. Amazon’s 20 years old looking website interface needs to be changed. Its pathetic design of all white with small tint of orange color interface reminds me of the dresses of Hindu Windows were forced to wear. Though they never got the luxury of using the tint of orange color. It simply shows Amazon can not load a website faster with great looking eye candy graphics – its a failure. They might be the biggest Cloud Computing company now, but their white website openly speaks that, they are well ware, that Akamai is the king of Content Delivery Network. But this article is not to curse Amazon, but to write about Free Cloud Computing Platform as a Service (PaaS) from AppFog. Basically the deviation started from cursing Heroku. Few weeks ago, Heroku’s several instances went down due to astrological curse. Firstly it made Heroku’s poor formula open, secondly it proved that Amazon has not much difference with Microsoft Windows, thirdly it has shown, Facebook badly promotes a third class product. Flexible Options – from Apps like WordPress to infrastructure like OpenStack. Both Rackspace and HP uses OpenStack. Command Line Tools are available and allocated memory is scalable up to 512 MB for individual App (total 2 GB for 10 Apps). CLI is painful to use in Windows, probably it is only a point that goes in favor of Heroku (Git Bash). Apart from Free Cloud Computing Platform as a Service (PaaS) from App Fog, they have paid services. But for paid services its far better to use Rackspace directly (I know you need to work more for the setup) for the quality and fanatical support. Most importantly, what you will do with a paid PaaS for public Cloud ? 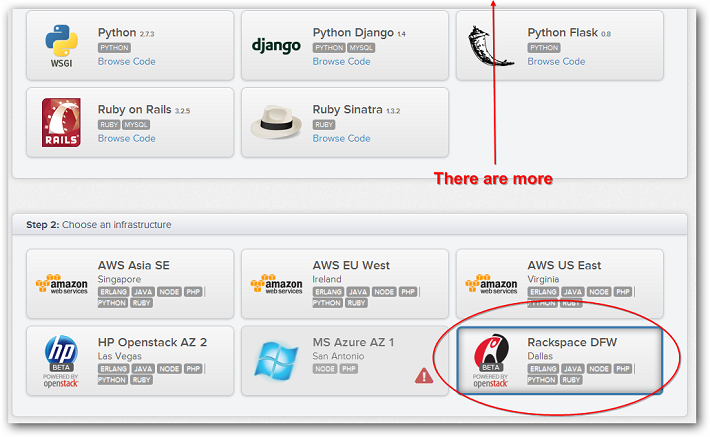 A simple Cloud VPS from Rackspace is more flexible. So the corollary is becoming – Free Cloud Computing Platform as a Service (PaaS) from AppFog appears to be the best but for paid PaaS, probably you need to think about a VPS. This Article Has Been Shared 7923 Times! Cite this article as: Abhishek Ghosh, "Free Cloud Computing Platform as a Service (PaaS) from AppFog," in The Customize Windows, September 19, 2012, April 18, 2019, https://thecustomizewindows.com/2012/09/free-cloud-computing-platform-as-a-service-paas-from-appfog/.